This book was huge. One-thousand pages and the font size really makes it feel like it’s double that size. Brandon Sanderson has deservedly swept the fantasy world off of their feet. With his own fantasy and through his completion of Robert Jordan’s epic Wheel of Time series. 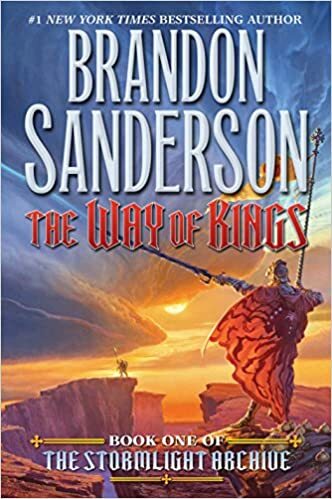 The Way of Kings is the beginning of Sanderson’s own efforts at a sprawling, epic sort of universe. It took about three-hundred pages for Sanderson to really get his hooks in me as a reader. Usually I would have bailed, but I’ve loved his other work and this series came so highly recommended to me. Let’s be honest, he’s pretty unmatched in world building. A very unique world with a ton of cool mythology. Sanderson also does an excellent job of creating characters worth following. I loved the grand scope, but struggled with the paragraph to paragraph writing. He has a pretty quirky sense of humor, which often had me skipping on to the action scenes or some of the more interesting events. The payoff is there and I’m definitely going to move on to the second book, but I didn’t love this world the way I loved Martin’s or Steven Erickson’s. Not as much of the wow factor. I snagged Marie Lu’s incredibly popular book after my agent, Kristin Nelson, bragged about it to me. It’s also just kind of amazing that I’m represented by the same agent as the person who wrote a book that’s garnered this much acclaim and attention. Kind of cool. And Lu’s book lives up to the hype. We set our feet down in a dystopian Los Angeles. The two characters we follow are Day and June. One’s a notorious criminal being sought after by the Republic. The other one is the government prodigy and darling. When Day commits his worst crime yet, June begins a hunt for enemy number one. Lu writes in a very cinematic style. Quick, visual, and dynamic. I’ve read a lot of stories recently with split perspectives. In almost every case, I found the narrative weakened by the fact that I really loved one character, but didn’t care that much for the other. Not the case here. Day and June are both mesmerizing characters, for their differences and similarities. More importantly, Lu paces the plot so we never feel too bogged down in one side of the story. It’s balanced, quick, and entertaining from the very start. One of my favorite reads since I’ve come to Switzerland! This book came highly recommended as well. After I purchased it, Chu actually took home the John W. Campbell Award for Best New Writer. In spite of all the mess at the Hugo’s this year, I found most every blogger and writer agreeing that Chu’s win in that category was well-deserved, and a sort of small highlight to what was an otherwise dour event. In Time Salvager, Chu continues his stellar work with an incredibly cool world. We’re in the very distant future and, unfortunately, humanity is struggling to sustain itself. The only possible saviors are the chronmen. Trained to go back in time and salvage necessary materials from timelines that are about to be destroyed, these men and women are all that stands between humanity and destruction. Chu delivers on what I like to think of as the promise of the premise. Our main character is playing with time. Naturally, we’re set up to expect that events are going to go completely awry. Chu takes the excellent idea backing his book and delivers by taking us through all the possible, interesting complications that could happen in the world he’s created. Chu’s story follows James Griffin-Mars. The sort of rowdy hero we’d expect to be borne from such a grim world. James demonstrates the kind of realistic character we’d expect in this situation. He’s continually asked to go back to timelines of great tragedy, but he can never save any of the people he witnesses being destroyed. This pain acts as the cornerstone of James’s life and we get to see his world crumble as that cornerstone threatens to give way. It makes for a compelling protagonist in a uniquely rendered world. So I loved this read, but I will say that the simultaneous reading of Chu and Sanderson tested my quirky humor tolerance. Chu’s just a funny guy, and it comes out in his writing and some of his jokes. That didn’t stop this from being a vastly entertaining world with a great scope and some excellent characters, though.